Right, this little baby has BMX Wheels and an aluminum frame. The sport of dirtsurfing (otherwise known as inland boarding) was invented by sports enthusiast Australian Graeme Attey back in around 1999. His aim was to capture the fluid turning motion of surfing and snowboarding on land. It came to North America in the early 2000’s. This is an extreme sport for all seasons. It looks … odd, to say the least, but this weird new contraption is actually easier to learn than any other board sport today and this is no empty boast… all new riders will be up and carving, linking turns downhill within their first session. Most people are comfortably riding within minutes! Weighing around 7kg the board is about 150 cm and is unique in that it incorporates a patented steering geometry where the front wheel pivots from a point in front of and below the axle of the wheel, via the ‘Swingarm’. The rider’s weight automatically centres and straightens the front wheel, creating stability and control. 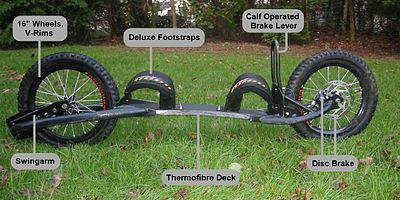 Another feature of the Dirtsurfer which is not found on other four-wheeled boards is that, much like a bicycle, the stability actually increases with speed, thanks to the gyroscopic action of the large wheels. You have to push with your front foot because the frame is slightly lower at the rear and so it feels really wrong to push with the rear foot. Also, the deadman’s brake button HAS to be under the rear foot and which activates when you fall off, to stop the board from rolling away. It’s not as difficult as you might think to get used to the ‘old style’ skate pushing. The main braking system is operated by the calf of the rear leg and provides complete control by working on a rider’s natural tendency to lean back on to the brake when travelling too fast. It was specifically designed and targeted at snowboarders and surfers who wish to ride when the surf isn’t up or the powder isn’t there, but it is a far more versatile sport. You can dirtsurf pretty well anywhere – on grass, dirt or paved hills, fields, forest trails, bike paths, beaches… or skateparks. You can even use a kitewing with it. That’s the versatility of this great inline board. 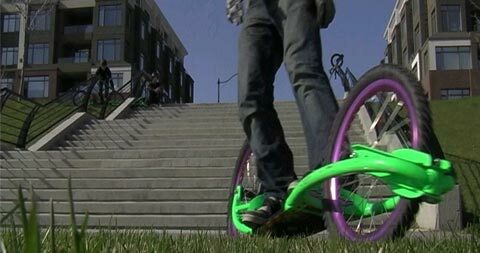 It has a price tag of around $450.00 and a speed of up to 70 mph which is a lot faster than surfing and snowboarding. It’s easy to see why this is one of the fastest growing inline boarding sports. « Vertical football – will this be a growing trend? great article. well said … We are really glad that you posted this. http://www.dirturfer.com or dirtsurfer.ca if you want any more info. and if you are a retail store or ski resort looking to carry the sport in North America just visit the distributor Action Sports Enterprises.